UNITED NATIONS, May 20 – Despite written evidence that indicted war criminal Jean-Bosco Ntaganda serves as Deputy Coordinator of the Congolese Army's operation Kimia II in the Kivus, chief UN peacekeeper Alain Le Roy on Wednesday said he hasn't seen this evidence, while acknowledging that Bosco is “in the area.” Inner City Press, which on May 11 sent the evidence to Alan Doss, the head of the UN's Mission in the Congo (MONUC), later on May 20 sent it to Mr. Le Roy and his spokesmen, asking on deadline for a response on this, if Nepali APCs finally reached Darfur, and about Irish soldiers serving the UN in Chad. As of midnight, none had been received. Le Roy acknowledged that there are in the Congolese Army, which with MONUC works, “some elements behave in a very terrible way.” What does the UN do? It raises to issue to the government in Kinshasa, led by Joseph Kabila. So far without effect, it must be said. Similarly, when asked by Inner City Press if he will made public what Troop Contributing Countries actually do with peacekeepers sent home charged with sexual abuse, Le Roy said that his unit, DPKO, doesn't get enough information, but that he'll push for more. Will the information be made public? “I will discuss it with the home countries,” Le Roy said. “I think it is a good idea.” We'll see. Video here from Minute 13:05. 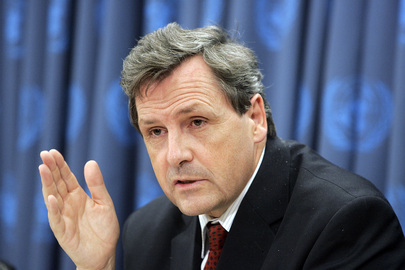 Le Roy argued that the number of complaints of sexual abuse and exploitation by peacekeepers has decreased from 357 in 2006 to 83 in 2008. But as pointed out by Colum Lynch of the Washington Post, soon to close its UN bureau, the UN's numbers are cooked because in 2006 it counted individuals, while in 2007 and 2008 it counted incidents. Is the decrease due to gang rapes? Le Roy promised a more substantial study, of which Inner City Press has requested a copy. Inner City Press asked about the follow-through on then Secretary General (and former DPKO chief) Kofi Annan's 2006 pledge to not use Fijian peacekeepers unless democracy was restored there. Le Roy said that the Fijians are needed in Iraq. Inner City Press asked, are you trying to replace them? Yes, Le Roy said, but so far there are no pledges. Video here, from Minute 40. In Nigeria 27 soldiers who served as UN peacekeepers were not paid, mutinied and have been given life sentences. Inner City Press asked Le Roy what he does to make sure peacekeepers get paid. I am going to Nigeria, Le Roy said, adding that troop contributing counties are sovereign and are free to pay or not pay to soldiers the money the UN gives them. But does the UN have to keep paying countries like Fiji, or now, Nigeria? Watch this site.